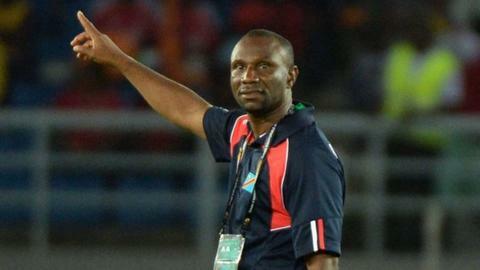 DR Congo qualified for the final of the African Nations Championship (CHAN) by beating Guinea 5-4 on penalties. After an entertaining goalless 90 minutes Jonathan Bolingi scored what he thought was the winner in the first period of extra-time. But Guinea's Ibrahima Sory Sankhon made it 1-1 in the final seconds of the game to send the tie to penalties. In the shootout Congo's Ley Matampi saved from Mohamed Youla to send Florent Ibenge's side to the final. The victory secures DR Congo's place in Sunday's final to decide the winners of CHAN 2016. They will face either Mali or Ivory Coast, who meet in Thursday's semi-final. DR Congo's best chances in the first half fell to Meshack Elia, who sent a freekick wide of the target, and then to Doxa Gikanji, who scored a spectacular goal against Rwanda in the quarter-finals. This time though, his shot from the edge of the area was pushed away by goalkeeper Abdoulaziz Keita. Congolese defender Padou Bompunga will miss the final after he was booked just before half-time giving him a suspension for two yellow cards in successive matches. Bolingi had chances to score in normal time but one of his efforts found the legs of a Guinean defender and then he failed to connect fully with a more acrobatic effort. In between those efforts, Sankhon got his head to a dangerous looking attack from Guinea, but keeper Ley Matampi saved for DR Congo. With just three minutes left on the clock, Guinea were saved by the woodwork when Gikanji unleashed another fierce shot. The first goal of the match eventually came in the 102nd minute as substitute Guy Lusadisu crossed from the byline and Bolingi found the target with a superb diving header. Guinea won their quarter-final against Zambia on penalties with keeper Keita saving and then scoring the crucial spot kicks. But this time around he was upstaged by his opposite number Matampi, who saved two of the post-match penalties including one in sudden death from Youla to earn the victory. DR Congo won the inaugural CHAN tournament, which is only open to players who play in their own local leagues, in 2009 when it was played in Ivory Coast.